Juliette's head lowered as she took the book from Bea. The girl looked like she wanted to melt away into the wooden kitchen floor. Bianca smiled as she took the book. "You're welcome," she said. "I hope you like it." She then turned her attention to the space beside the basement door, where Eva had begun to struggle with the stuck zipper on her bag, trying to pack the last few of her things. "Do you two have a show tonight?" Bea questioned, her gaze flicking over toward Kennedy just as Eva managed to force the zipper open and slip her shoes into the bag. "Maybe I'll come watch." "Not me," Kennedy said with a shake of her head. "Eva does. But you should come anyway." Bea grinned. "Then I can sit with you and watch," she said. "I never get to actually sit watch shows with you. You're always in them." Hugo looked up from where he had settled himself at the kitchen counter. "Do it!" he chirped, obviously excited by the idea. Fine being both passive and aggressive. i suppose it depends on the story, though i usually tend to swing passive. As the group's attention shifted away from her and back to Eva and her show tonight, Juliette took the opportunity to slip upstairs and put the book on her dresser with the last book in the series that she had been reading. She noticed how new it looked compared to Jupiter's copy and worried about being the one to have to wrinkle the spine.The last time she'd kept a book in her room, her father had ripped it up in a fit of rage and she had to search the couch cushions for lost change to pay the library fee. She missed the library and its quiet safety. There were never any expectations on her there except the rule to stay quiet. She was always good at that though. She could keep everything locked up and keep everything down. She wanted to figure out how she would make or find presents for everyone but she felt she was expected downstairs. Just not what was expected of her. She hadn't been asked if she was going to the Eva's show today yet, but she figured if everyone else was going, they wouldn't trust her to stay here alone. Her shoulders were sore from the tension she was always holding there, especially today. She went back downstairs after another few minutes and sort of hovered by the kitchen counter, making little braids in her hair with swift but nervous fingers. A few hours later, Eva sat at her vanity in the bedroom, wearing an old flannel several sizes too big for her, and her hair pulled back into a ponytail to keep it out of her face. Her makeup case sat on the edge of the table, though it held next to nothing, as most of her makeup lay scattered about the table before her. 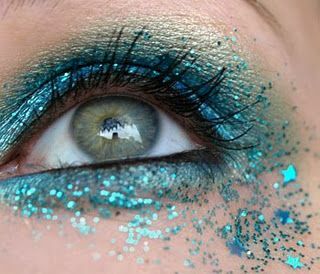 Ronan sat perched on the edge of the bed, watching her finish her eye makeup with interest, though she wasn't quite sure just how long he had been there. If he'd been watching the entire time she'd been doing her makeup, then he'd been there for at least a couple of hours. He often sat and watched her do her makeup, and as long as he was relatively quiet and didn't interrupt her too often, she didn't mind his presence. Her shirt was covered in smudges of makeup by now, part of it fallout from what she'd brushed off her face and part of it smudges from what she'd wiped off a brush, or her fingers, or anything else. Not that she cared. The shirt's only purpose was to keep her makeup from falling somewhere she didn't want it. It was far too big for her to wear for any other reason. Eva turned to rummage through her makeup case, an exasperated huff escaping her lips before she turned back to look over her shoulder at Ronan. "Could you run downstairs and see if you can find my eyelashes? I think I left the 301's in the bowl by the door last time we went out. Probably just pulled them off and passed out. I need to put my eyelashes on and then we can go. My lips aren't done but the rest of my face is finished. I can finish up at the bar." Ronan nodded and scrambled down the stairs, skidding to a stop at the bottom. The eyelashes were where Eva had said they would be, and Ronan grabbed the pairs from the bowl before turning to Kennedy. "Eva says she's almost ready to go," he said, partly to Kennedy and partly to the rest of the room,. Everything had gone relatively smoothly with her grandmother while she was here. She didn't try to start any heavy conversations, really, but Juliette still felt like she was walking on eggshells most of the time. She was growing increasingly frustrated with herself and her mounting paranoia so she had gathered her courage and decided to read the book she was given, curled up in the corner by the armrest of the large couch in the main living room. She had to read the same page more than once sometimes because every movement and sound near her was apparently a potential threat to her brain. She grit her teeth a lot and her facial expression looked unintentionally irritated. That's where she was when Ronan walked in from upstairs and her eyes snapped up to look at him over the pages of her book. She was just getting to another good part too! "Eva says she's almost ready to go," he said, partly to Kennedy and partly to the rest of the room,. Juliette felt like she'd swallowed an ice pack. She had nearly forgotten about the performance Eva had tonight, waiting on someone to give her instructions on what they wanted from her. Her eyes flitted across the room to each of the family members around her and waited just a few more seconds for a commanding voice to tell her what to do. No one did. Her breaths came quicker now, but she wasn't sure if that was out of anger or fear and she was more angry with herself than anything. "Are you bringing me with you or am I to stay here?" she asked, almost dizzy with the sudden rush of recklessness. Her volume was at a normal speaking level, but it was the loudest Juliette had said anything since she arrived. She hadn't moved from her spot, but her body was tense and she wondered if this could be a viable strategy for figuring out her boundaries. If she just kept speaking out of term with no regard for her own safety or the alarm bells clanging relentlessly in her head, maybe one of these days someone would slam her into a wall and she would finally be able to gauge a sense of the limits around here. Ronan had vanished back up the stairs before anybody could respond to him, and Kennedy turned back to look at Juliette as she spoke, the loudest the girl had said anything since her arrival a few days earlier. Kennedy opened her mouth to respond, but Jupiter beat her to it, speaking up from where they were settled in a chair in the corner of the living room. "You should come with us," they said. "You might have fun. Everyone's really nice. And you won't be by yourself. One of us will stick with you. I will, specifically, if you want." At that moment, Eva descended the staircase, her having been curled into loose waves, and her makeup fully done, save for a few smaller details she could finish at the bar. She looked across the room at Juliette, fiddling with the sleeves on her oversized shirt as she did. "You don't have to come," Eva told her. "But you never know, you might enjoy yourself." Jupiter's response made her think they might be angry with her if she didn't go. That she "should" go meant she didnt really have a choice. She memorized what page she was on, then closed her new book and lowered her gaze while she heard someone in heels descending the staircase. Eva appeared, messing with her sleeves and amending Jupiter's suggestion. Juliette hesitated, then asked, "Would I be by myself if I stayed here?" She really wondered if it would it be more dangerous to go someplace with alcohol where she didnt have hiding places or here with just one other person? The thought of the second scenario made her chest feel tight. No matter how high or drunk her father ever was, he'd never hurt her in public. Any normal young girl asking if she would be left alone may look afraid that the answer was yes. Juliette worried that the answer would be no. "Probably," Kennedy said. "Unless somebody wants to stay here. You can stay here if you want to. You don't have to come with us if you don't want to." She knew that Juliette would probably not mind being left alone, but a part of her still felt bad about the idea of leaving her niece at home on her own. "I can stay with you if you want me to." She wondered if Eva would be fine if she didn't go. Usually she was the one in charge of helping Eva with whatever she needed during the show, but Jupiter had been more than enough times. Maybe they would be fine to do it for her. Juliette's face screwed up in frustration, but she kept her gaze on the patterns on her mismatched socks. She wasn't angry at them, just that she had to make this decision. She didn't know the right answer and she didn't even know what she wanted in this case. It was like choosing the lesser of two evils when she had always been told what to do. And Eva was all dressed up too. She remembered the pictures on the wall with everyone in stage makeup and she was lying to herself if she wasn't curious about what this family-wide hobby was about. Besides, she couldn't stay cooped up in this house forever, she was already driving herself insane wondering when things would go wrong in here. Sure, she'd never been to a bar, but that also meant nothing bad had happened to her in one. Juliette huffed and stood. "Nevermind, I'll go with you. Is there something specific I should wear? Is it...upscale..or something?" she asked, trying to figure out a presentable outfit from her meager clothing options, holding her book close to her chest. Kennedy smiled and shook her head when Juliette asked if there was anything special she should wear. "You can go the way you are," she said, stepping sideways to let Eva slip past her as she took her bag out to the car. "Nobody will mind. But you can change if you want to. Nobody's usually really dressed up unless they're performing." She watched Juliette close her book, and then wondered if the bar might be too overwhelming for her. "You can bring your book with you," she suggested. "If you decide you'd rather be left alone you could always sit in the dressing room and read." "You can go the way you are," she said, stepping sideways to let Eva slip past her as she took her bag out to the car. "Nobody will mind. But you can change if you want to. Nobody's usually really dressed up unless they're performing." Juliette nodded and started to head towards the stairs to grab her shoes, but stopped when Kennedy spoke again. "You can bring your book with you," she suggested. "If you decide you'd rather be left alone you could always sit in the dressing room and read." "Okay," she nodded, grateful for the option. She made a mental note to find the dressing room when they got there, so she knew where it would be if she needed it. Then she climbed up to the guest room and got her shoes on before joining everyone else who wanted to go in the car to Eva's performance. She spent the car ride fiddling with the edges of her new book's pages and trying to calm her racing thoughts so that when she got there, she would hopefully behave like a functioning human being and not a terrified squirrel. They arrived at the bar and Eva was the first one out, with Jupiter grabbing her bag from the trunk and scampering after her into the bar. Ronan and Hugo followed close behind them with Bea, Kennedy waiting to go in with Juliette. Inside, Eva gave a small wave of acknowledgement to the bartender and then paused at the top of the basement staircase. She could hear the tinny sound of music playing from someone's phone, so someone had to be down there getting ready. 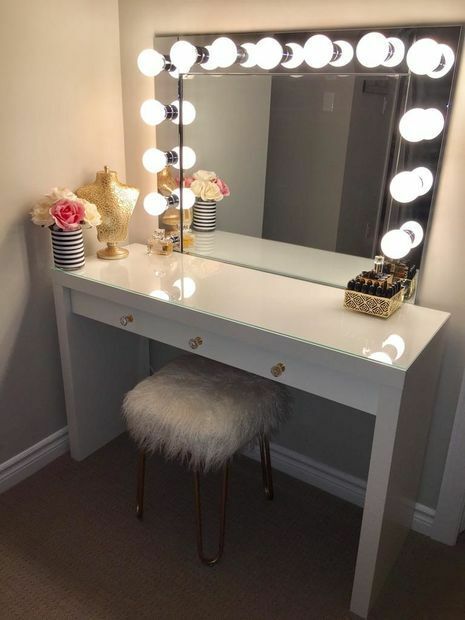 She slipped through the doorway and down the staircase, grinning as she caught sight of Cherie in an old desk chair, only half dressed and leaning forward to fix her makeup in the mirror. The man in front of the mirror was taller than Eva herself was by a couple of inches, heavily tattooed down his arms and across his bare chest. 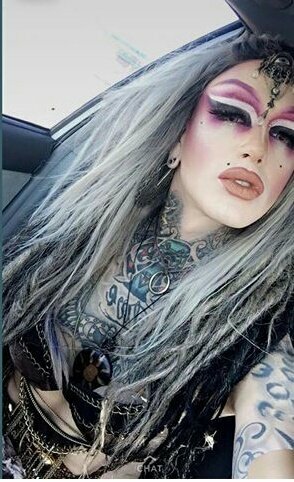 In the right light, you could see the scars that were smattered across the younger drag queen, most of them carefully hidden by the tattoos. Cherie looked up before Eva could say anything, and sprang up to give Eva a tight hug. "Hi!" she chirped. "You look nice." Eva gave Cherie a suspicious look. "A compliment from you before the end of the night? I'm shocked." "Just don't tell anybody I'm being kind," Cherie answered with a smirk. "I tolerate your presence at best." "I see you've brought the possum wig," Eva teased giving Cherie a light shove and, gesturing to the silver tangled wig atop the pile of Cherie's things. Cherie glared at her before leaning down to inspect her makeup in the mirror. "It needs. Brushed," she stated flatly. "And you look like a lady lumberjack, you can't talk about my wigs." "I was thinking farmer," Kennedy said, rounding the corner as she came after down the stairs after Eva. "But I suppose lumberjack could work." Kennedy smirked and reached out to give Cherie a hug. Eva rolled her eyes and drifted past them into the smaller side room. "I'm going to get changed," she said, pulling her bag after her and vanishing around the corner. "What needs brushed?" Jupiter asked, slipping past Cherie. "I'll do it." They grabbed the wig and took to brushing it out, perching on the edge of a stool off to the side of the room. "Thank you, doll," Cherie said, her attention turning back to the mirror again. "I wish my drag children were half as useful. They'll probably both end up being late again, otherwise I'd have Lita do it. Not that she'd do it well." Her words, although seemingly harsh, held a hint of affection and amusement. "Lita still can't pin her wigs on right, and that's why she's just helping with Lucy's number instead of having her own." "Sal's around someplace, though," she added. "I think he went to get a drink, but every time he goes to the bar he just ends up talking to Angelo for thirty years." She grinned as Hugo and Ronan slipped into the large room behind Kennedy. Juliette had to work to keep calm as the car rolled to a stop and everyone excluding her aunt and grandmother exited the car. She only hesitated a moment before following after them, briefly catching a whiff of smoke and alcohol before she coughed and decided to breathe through her mouth instead. Kennedy greeted the bartender before she headed down a narrow staircase and Juliette tentatively followed with the sound of music from a cell phone and friendly conversation getting louder with every step down. Kennedy integrated herself into the dialogue easily and gave a hug to the person with the heavy makeup while Juliette tried to find a spot in the room where she could stand without getting in anyone's way. Then Eva left, but Juliette didn't see where because her eyes had ended up stuck to the tattooed man half dressed in front of his mirror. The dark designs all across his skin conjured similar images of men that had visited her father often, usually to buy drugs,...sometimes other things. Juliette clenched her firsts around the book she was holding, forcing herself back into the present before she could freak out. Breathe. It's just a person, she thought, but her thoughts spoke back: danger!danger!danger! She shook her head and her eyes caught something different. Marks that weren't tattoos, but raised...scars. They were hidden well, but when the guy turned his wrist or arm a certain way in front of the vanity, she could see their edges, probably because she had tried before to hide her own with makeup and could never get them to disappear quite right. Instead she wore long sleeves like the shirt she wore tonight, gray and a little small on her. Finally she could pull her gaze away when her eyes flicked toward the movement of Ronan and Hugo heading someplace else. Juliette took that opportunity to escape and followed them out. She didn't know where she was headed, but with Hugo's nervous tendencies, she hoped it was someplace they would both find more comfortable. Ronan trotted to the other side of the room with his brother, taking a seat on one of the old bar stools that were pushed against the wall. He could still see the others, but thought it best to stay out of the way. Cherie nudged him gently as he passed, and he stopped to hug her before sitting down. She didn’t continue to interrogate Juliette, and Kennedy suspected that she could sense the girl’s nervousness. She glanced back towards the mirror and picked up a brush again, smoothing out some small imperfection in her eye makeup. After a few moments more, Eva stepped back into the room again. Her dress was a dark turquoise, accented with small rhinestones in several places. Over top, she wore a corset in a slightly darker shade. It had been laced in the back, but not nearly as tightly as Eva wanted it. She had changed her shoes to the ones she had packed earlier in the day, and she gave a small smile as she came into view. "Well? she asked. "How do I look?" "Terrible," Cherie said, hardly glancing up from the pile of her things she had been rummaging through. Eva rolled her eyes and grabbed the nearest thing to her, which happened to be what Cherie used to fill her bra--a ball made of cut nylon tights that Cherie had filled with rice. "Shut up and go get dressed," Eva said, rolling her eyes and tossing the ball towards Cherie, who caught it and tucked it into her bra. Cherie took her wig from Jupiter and drifted past Eva to slip into the same room that Eva had just left, pausing as she passed to put an arm around Eva's waist and give her a tight squeeze, a teasing glint still in her eyes. "Ignore her," Kennedy said as Eva reached her. "I for one, think you look ethereal. Here." She turned Eva around and fiddled with the ribbons on the corset before pulling them taut. "How's that?" "You won't be able to breathe if she goes any tighter," Ronan piped up from where he sat next to Hugo. "I'll be fine," Eva said, straightening up as Kennedy continued to tighten the corset. Kennedy looked to Ronan and rolled her eyes, and the boy snickered, ducking to hide his face from Eva.